This ropa vieja crockpot recipe is comfort food at its best. Serve with white rice and smoky stewed black beans. Yum! Why Is It Called Ropa Vieja? The actual translation of “ropa vieja” is “old clothes.” Doesn’t sound so tasty and delicious, I know. But legend has it that a man didn’t have enough money to feed his family and so he shredded and cooked his clothes. He prayed while the clothes cooked and slowly the meat turned into a tasty delicious meat stew. I don’t know about you, but I like this legend. 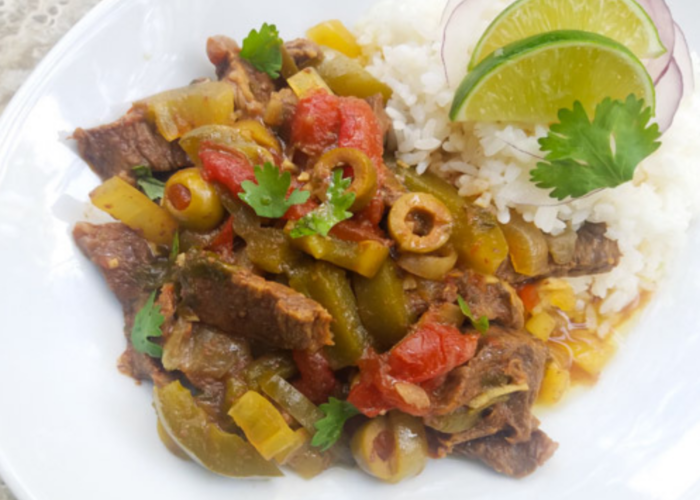 Where Did Ropa Vieja Originate From? 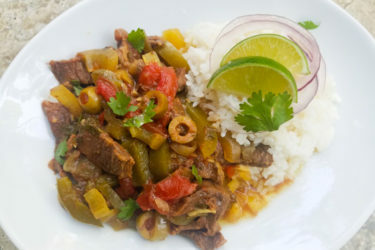 Ropa vieja originated from the Canary Islands, Spain. It dates back to colonial times when the Spanish conquistadors settled in Latin America and brought with them their favorite dishes. Eventually this dish became so popular that Cuba adapted it and it became their national dish. Go to any Cuban restaurant and no doubt you will find it on the menu. 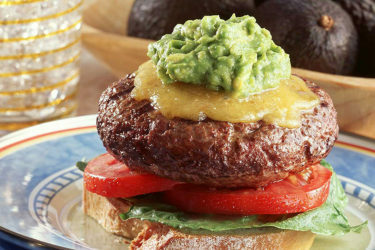 So why have I chosen beef chuck instead of the traditional flank steak? One, that’s all I had at hand at the moment and two, beef chuck cooks so much better in a crockpot. Because flank steak is a leaner meat with hardly any fat content, if cooked incorrectly it tends to dry out. Also, if you’re looking for a cheaper cut of beef other than flank steak, beef chuck may be the way to go, and you won't sacrifice on flavor. 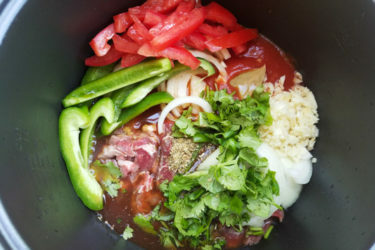 In summary, making a ropa vieja recipe with beef chuck in a crockpot will come out moist, tender and mouth wateringly delicious. Note: This ropa vieja didn’t come out as “shredded” or “saucy red” because I cooked it for less time in the slow cooker this time because I had hungry impatient mouths to feed and didn’t have the amount of tomato sauce I normally use… it still turned out hyper delicious but explains why it’s less colorful and shredded looking. Cut meat into thin strips. Season with salt and adobo, if using. 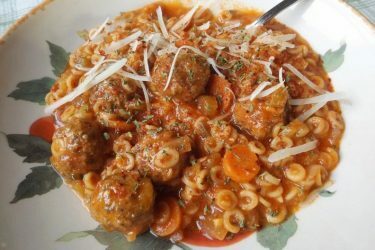 You can brown the meat in a heavy skillet with a few tablespoons of oil if you would like, I normally just add most of the ingredients together into the crockpot. 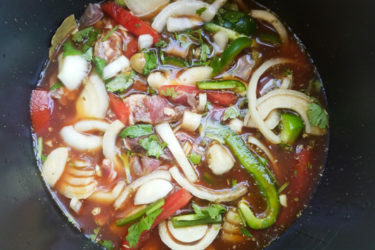 Add all ingredients except cilantro and olives into the crockpot and cook on high for 4 hours, or set to low for 6 hours. After 4 hours stir in the cilantro and olives. Serve with white rice. 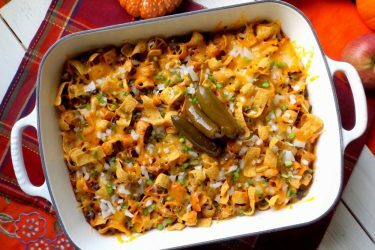 Traditionally, this dish is also served with stewed black beans. Sprinkle lime juice over your ropa vieja and enjoy!